View of “Karon Davis: Pain Management,” 2016. A consortium of props and decor offers a capacious mix of memories, myths, and maladies in Karon Davis’s solo exhibition “Pain Management.” Reflecting on the physical and emotional experience of suffering and loss, Davis brings us into what was, until recently, her world, which was confined to her husband’s bedside in a hospital as he underwent cancer treatment. She takes us on a hallucinatory journey as told through the re-creation of a waiting room and eight characters composed of plaster casts, and one of shredded medical bills, indicating the financial as well as affective burden she carried throughout this ordeal. 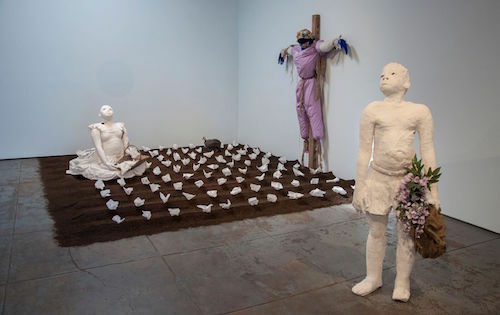 The omnipresent nurses in scrubs take center stage: Here, they assume the symbolic form of a narcotic angel in Morphine (Angel) (all works 2016), a scarecrow for Isosfamide (Scarecrow), and a caretaker in Nicotine, (Seated Nurse Smoking), eschewing the humor, affect, and pathos that the artist likely negotiated throughout Noah Davis’s stages of illness. The sculptures of children, a series titled “Children of the Moon,” include Mawu (Holding a Basket), who seems to be grimly reaping Elizabeth V. Spelman’s “fruits of sorrow” from the scarecrow’s field, while Mary (Catching the Moon), attempts to play catch with the moon; another, Oya (Holding a Scarab Beetle), gazes upon the insect resting on the palm of his hand. These melancholic figures reference Davis’s interest in Egyptian mummification, providing a historical and cross-cultural perspective on the treatment of death, transcendence, and preservation. The largest piece is the one that ties this exhibition together—an overwrought box of Kleenex tissues titled Cry Baby. Davis’s rapport with this icon of sorrow transports us into familiar recollections of affliction. As if to encourage catharsis, an unobtrusive box of Kleenex similar to the artist’s sculpture sits near the guest book, waiting for you upon checking in or checking out.